Question: Where do pistachios come from? Answer: The only time we ever had pistachios around the house when I was kid was Christmas time. I am not sure if someone sent them as a gift or my parents just splurged and bought them for the Christmas season. Whatever the reason, I loved pistachios and still do until this day. Many people like me enjoy eating pistachios. However, they are not sure where pistachios come from. In general, nuts and seeds are difficult to figure out how they grow since they are all so similar in their characteristics. Let’s take a look at how pistachios grow and determine where they come from. 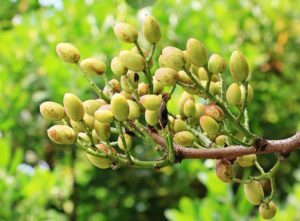 The world’s largest producer of pistachios is Iran. The second largest manufacturer is the United States with less than half the production of Iran. Over 98 percent of the pistachios produced in the United States come from southern California due to its ideal growing conditions. Other states that farm pistachios are New Mexico and Arizona. The pistachio tree (pistacia vera) thrives in dry desert conditions but can tolerate a wide range of temperatures. They enjoy low humidity with periods of extended high heat. Excessive wet conditions and extreme low temperatures can result in minimal crop production. Harvesting of the pistachio in the United States occurs in late summer and into early October. There is essentially a six-week period where the pistachios must be harvested. The seeds are ready to harvest when the shells have naturally split open and the hulls have changed from green to a near red color. Commercially, a machine vigorously shakes the pistachio tree to remove the pistachios for collection. The pistachio is not a nut as believed by many. Like the almond, it is a drupe (fruit) that has a fleshy exterior that is surrounded by a shell, which houses the seed (the edible pistachio). Similar drupes include peaches, cherries, and plums. After the pistachio is harvested, the hull is immediately removed to prevent potential mold growth and discoloration of the seeds. The seeds are rinsed, dried, seasoned, and roasted before packaging for sale.